Carry some drink and food with you on the longer walks. Dont drink from streams regardless of how clean the water appears as water purity can not be guaranteed. Take a light parka and warm sweater in case of weather changes, particularly on the longer walks. Please respect and help protect the environment by not leaving rubbish behind or lighting fires. Although most of these walks are in public reserves some walks cross private land. Avoid disturbing stock, close gates after you and use fence styles where they are provided. Dogs are not permitted on walks. Remember that unsealed roads can be very narrow. Reduce your speed to below 40-50 km/h to help you to maintain control of your vehicle and slow down even further when approaching oncoming traffic as the dust will obscure your vision. Vehicles ahead or oncoming traffic can throw gravel out into the air, which frequently damages windscreens and paint works. Another danger is that you can't stop the vehicle in time because the gravel acts as rollers between your wheel and road surface. Take special care when driving downhill on metal road, slow down, use your gears, and don't brake suddenly. If you are driving a rental vehicle, remember to check whether you are insured when driving on unsealed roads. 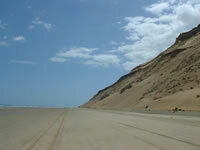 4WD vehicles are recommended for driving along the Ripiro Beach. If you are driving a rental vehicle, remember to check whether you are permitted to go off road. A maximum speed of 70Kmh is allowed however you probably will want to travel more slowly to appreciate all the beauty surrounding you. The Ripiro Beach has a 4 hour "safe driving window" 2 hours either side of low tide. The Kauri Coast offers a wide range of walking tracks and caters for all abilities. There are short and leisurely walks and longer walking tracks, some of which are more suitable for experienced hikers. 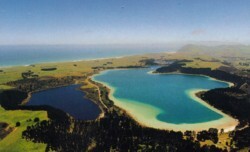 They take in a variety of breathtaking, unspoiled scenery, including native forest, farmland, coastal and hill country. 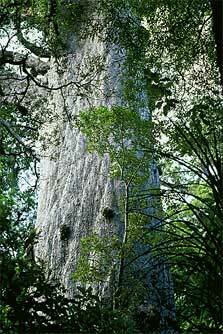 Visit Tane Mahuta in the Waipoua Forest, New Zealand's largest known living kauri tree. majestic Tane Mahuta, New Zealand's largest living kauri tree. Not far into the walk, a sweeping corner of the track suddenly brings you face to face with the ‘Lord of the Forest’. When you catch your first breath-taking view of this magnificent tree, you'll feel compelled to pause for a while. You can almost feel Tane Mahuta’s strength and ancient presence, and its overwhelming size makes visitors look like dwarfs. There is a wooden fence and a seat to view the tree. To get a broader view of Tane Mahuta, you can move further along the track, which then leads to another viewing platform. According to Maori mythology Tane is the son of Ranginui the sky father and Papatuanuku the earth mother. Tane was the child that tore his parents' parental embrace and once done set about clothing his mother in the forest we have here today. All living creatures of the forest are regarded as Tane’s children. For safety, it is very important to make sure you get current information from DOC before starting out. Phone (09) 439 3450. Few walks match the magnificent Maunganui Bluff for breathtaking scenery. The Bluff rises 460 metres from the sea below and comprises a 495 hectare scenic reserve, one of the few examples of dense coastal forest remaining in Northland. 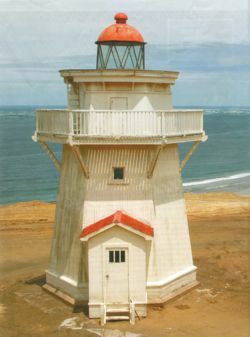 Located on the Aranga Coast Road, 40 kms north of Dargaville. It is a 3 hour return walk to the summit. The track climbs steadily and may prove difficult for younger children, elderly or unfit people, but generally this route is recommended for families. Tokatoka is a very distinctive landmark in the Kaipara district. The track surface is variable from grass, roots, soil and rock. 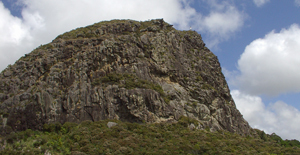 The track ascends continuously; nearing the top there is a particularly steep but short climb of 20 metres before the summit. From the top of this peak, the 360-degree views are stunning. It almost feels like being on top of the world and makes the 20-minute climb well worth it. You get great views towards Dargaville and of the Kaipara. On a clear day, you are able to see Bream Head and the Tangihua range towards the east. 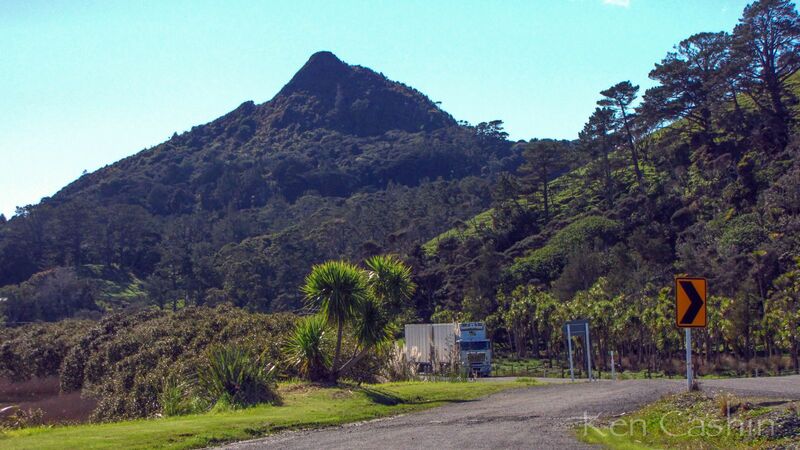 Collins Scenic Reserve is located on Gorge Road, 300m along the metal section of the road, travelling away from Maungatoroto. There’s a short walkway (15 minutes return) through the bush to a lovely stand of Kauri trees. Maungaturoto has its own Community Walkway which features open farm land and small bush sections. It takes about 20 minutes to walk one-way, and entrances are located at the Country Club and near the carpark at Otamatea High School (you can make a loop walk by returning along the road-side footpath). The walkway is open to everyone, and dogs are permitted on-leash – but the walkway is closed for around a month during lambing season. This is situated on Whaka Street beside St David’s Presbyterian Church. 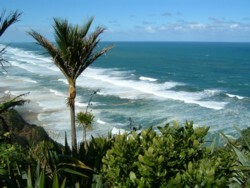 It is very pretty and is one of the few naturally-occurring stands of Nikau palm trees in New Zealand. There is a short loop walk through the bush (about 15 minutes), and dogs are permitted on-leash. Piroa Falls owe their origins to a band of hard volcanic rock which has resisted erosion, to create a spectacular waterfall into a deep plunge pool. They are especially impressive after heavy rains, and the pool provides an excellent spot for swimming. There’s a good picnic site on the bank, so it’s a perfect place for families in the summer months. The falls are located on Gorge Road about 5 km north of Maungaturoto (the road is metalled for the last few kilometres). Access is via a 5 minute walk into the gorge, developed by Rotary and DOC.